The apartment is located in a private cottage surrounded by a pleasant garden. You have central heating. It is only ten minutes drive from the beaches and typical seaside resorts. Shops, restaurants, pubs are all in the very proximity. The directions to the house were very good and it was easy to find. Kathe even met us at the gate and showed us the way in! We had loads of space - the lower floor of the house. It was located in a quiet area south of Modica. There was an extensive outside area with ample seating and shade, 2 patios and a lovely swimming pool. The apartment was well equipped. Kathe was a very hospitable host and gave us some homemade marmalade and freshly baked warm cake. We really enjoyed staying here. Our family inc kids(22yrs & 17yrs)lol, Were literally thrilled as we turned into electric gated villa grounds.Kaethe the host was very welcoming speaking German italian and much more english that I knew italian! Superb trees, palms,flowers, olive trees in a garden & grounds that will be forever jealous of, surround the accommodation on all sides. Plenty of parking. The out door spaces excel with the variety of seating, loungers & table options available to choose from in and out of shade.The good sized pool is kept clean both inside and out. kaethe is very discreet in her pool & grounds maintainace. The accom is set to side of small town, but it's budget cost, so should really expect a little traffic & community sounds. This doesn't however detract from it feeling safe and private. Inside the accom is generous with functional sized bedrooms 2 full bathrooms & washing machine... Which we used daily( August was hot as expected but also very humid!) so only lightest clothes could be worn but no probs, as able to wash & dry in hours. **Only warning-Mosquitoes in italy & med there is a new species called TIGER MOSQUITOES. you will need the highest protection even if dont usually get bitten. They shouldn't affect holiday if you have protection. I always react ( have even had two trips to emergency over the years in other countries ) so always take precautions creams sprays candles etc but these mos' bite during day as well as night and causing problems to locals & holiday makers. I used up all my own anti mos' supplies & tried local ones but still ended up in giant red welts. LUCKILY THE BEAUTIFUL POOL SOLVED ITCHING and kept me cool. Amazing holiday home, perfect for a family. The pool is so lovely. The property is spacious and comfortable. The outdoor area is amazing, with so much comfortable seating and a really great barbecue area. Then down a slope to the beautiful pool. A really private area, the pool is so clean, and hardly any chlorine, so no irritating eyes! Kaethe is a very welcoming host, we really enjoyed staying there and meeting her. The surrounding coastline is varied and interesting. Plenty of big waves and sandy beaches. Also great areas for snorkelling in the crystal clear waters. The nearest town, Modica is a lovely day out, and also Scicili is a really interesting town nestled in a deep valley. A wonderful place, sunny climate, but with a nice breeze. Very friendly people. Wholly recommend it. Well equipped, comfortable and clean. Owner very helpful and not intrusive. Very enjoyable stay in Modica. Accommodation very comfortable and clean. Owner very helpful and friendly. We enjoyed our stay at Casa Linde. It's a spacious very clean and well-equipped apartment with excellent outdoor facilities. In November the pool was closed but there was varied and flexible seating on the extensive patio which enabled us to catch some of the welcome sun. Käthe was a lovely host, bringing us fresh oranges and lemons and some wonderful cake! There are supermarkets nearby and the marvellous baroque town centres of this area are easily accessible. The main road nearby led down to Marina di Modica and we were able to relish warm sun by the Med at the pleasant bar on the beach. There are couple of points worth noting. The TV has just Sky news in English (we took a laptop with downloads and Netflix...). Casa Linde can be found up the road opposite the Peugot/Citroen dealer which leads to the small AST depot (the current HomeAway map shows it further along the main road!). If coming from the motorway from Catania it's better to follow the Google route rather than the Garmin Satnav one we used. 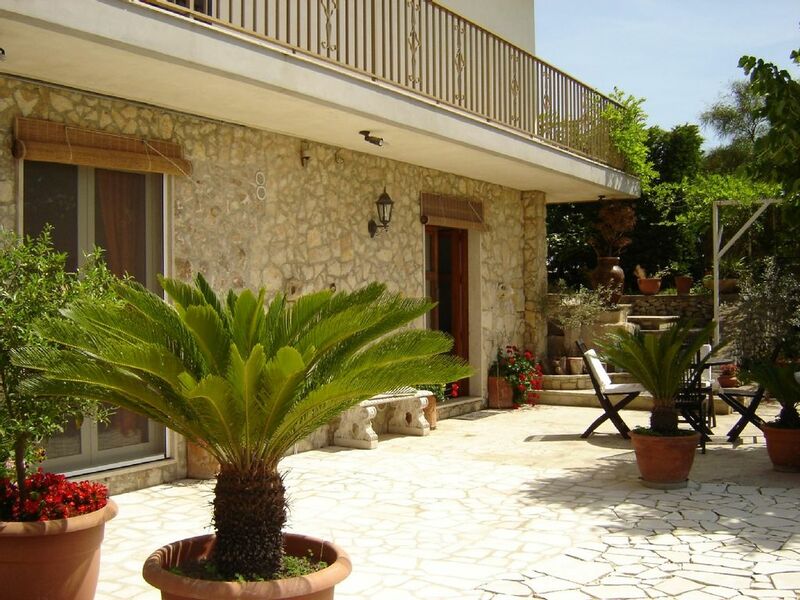 We'd recommend Casa Linde as a good all-year-round choice for south-east Sicily. Brilliant value and a delightful property. We (m husband and I and two kids aged 4 and 2) were delighted with Kaethe's property. It was spotlessly clean and very well equipped - Kaethe had thought of everything you might need. The huge garden was a delight to relax in and the pool was pristine and in a really lovely setting. Kaethe was very welcoming and friendly, baked us a delicious cake, told us when there were local events happening she thought we would enjoy and even bought presents for our children. Casa Linde was in a quiet and felt secluded and was brilliantly placed for visiting all the beautiful towns nearby. You will need a car if you stay here but apart from that it is perfect. Incredibly good value and a wonderful host - I can't recommend it highly enough. Modica is a 50.000 people little town, recently declared by UNESCO patrimony of humanity, flaunts a great logistic situation, close as it is to various other villages and cities: Noto, Siracusa, Ragusa. Modica is worldwide known for its baroque.